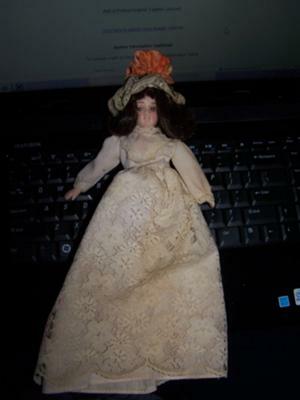 I found this doll at an estate sale. It is 13" long. Has porcelain face, porcelain arms, no legs. The inside is a small sack with a marking on it, see photo. It has real hair. The clothes are sewn on, no velcro. The face is smooth, not rough. There is one marking on the sack as is shown in the photo. 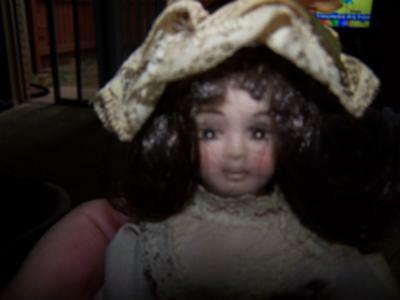 No other markings anywhere else on the doll though. Doll clothes sewn on or close with Velcro? Procelain finish kinda of rough? What does it say on the sack? Seems to be one of millions of imports from China made within the last twenty years.